Leland Little's upcoming March 2 sale features the iconic Frank Gehry "Power Play" chair, a "Margeurites" aquatint etching by David Hockney and a stunning diamond sapphire ring. 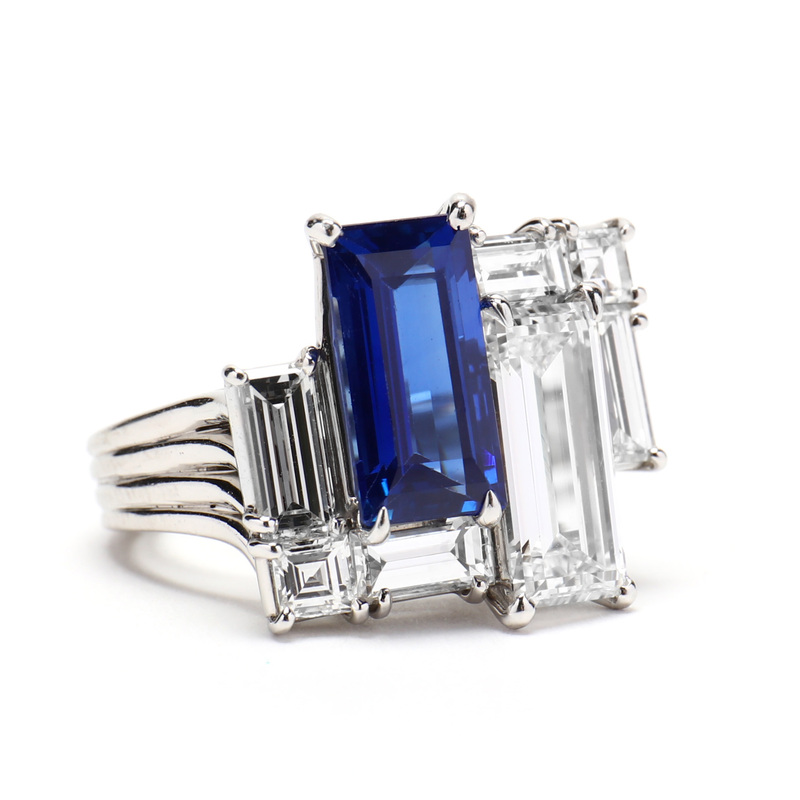 This stunning platinum ring is set in an asymmetrical design centering on a rectangular step cut Kashmir sapphire weighing 3.76 carats and a rectangular step cut diamond weighing 2.43 carats (D color, SI1 clarity). In addition there are two baguette cut diamonds weighing approximately 1 total carats, two baguette cut diamonds weighing approximately .52 total carats and two square step cut diamonds weighing approximately .44 total carats, with a split and curved shank. 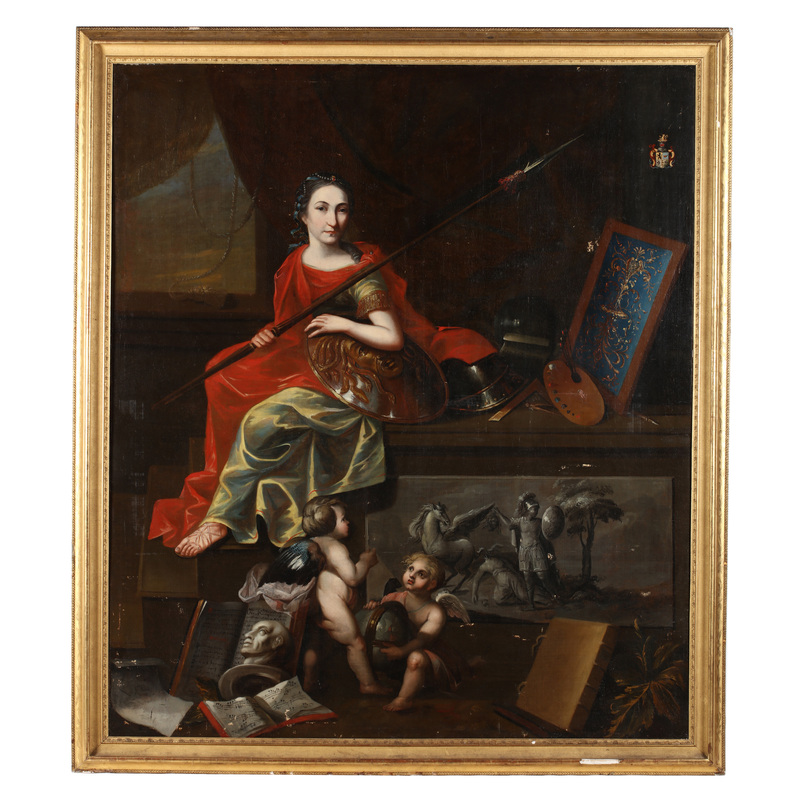 This portrait portrays Marie-Elisabeth de Blochausen, the daughter of a wealthy industrialist French family, portrayed as Athena in 1730. She is depicted in classical dress holding a shield featuring the head of a Gorgon (Medusa) and is surrounded by attributes of warfare and the arts, characteristic of Athena, the goddess of war and wisdom. In the 18th century, it was popular to portray royal or prominent family members as Roman or Greek deities, connecting their modern-day prestige to Classical authority. Farm in Winter, Dale Nichols. Gouache on wove paper. 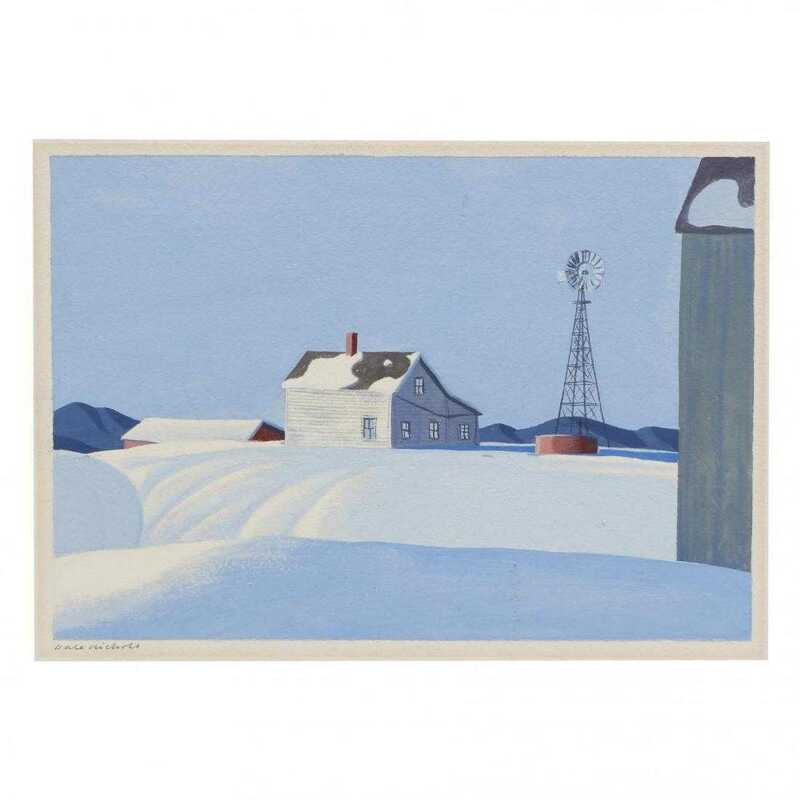 Dale Nichols (1904-95) is best known for his depictions of pastoral America, often under snow. He grew up in Nebraska and although he traveled internationally trhoughout his life, he was always drawn to the American midwestern landscape. Three of his works hang at the Smithsonian Art Museum. This work, titled Farm in Winter, is gouache on wove paper. Marguerites, David Hockney. 1973, etching and aquatint in colors. David Hockney, the most expensive living artist, created this etching and aquatint in colors in 1973. 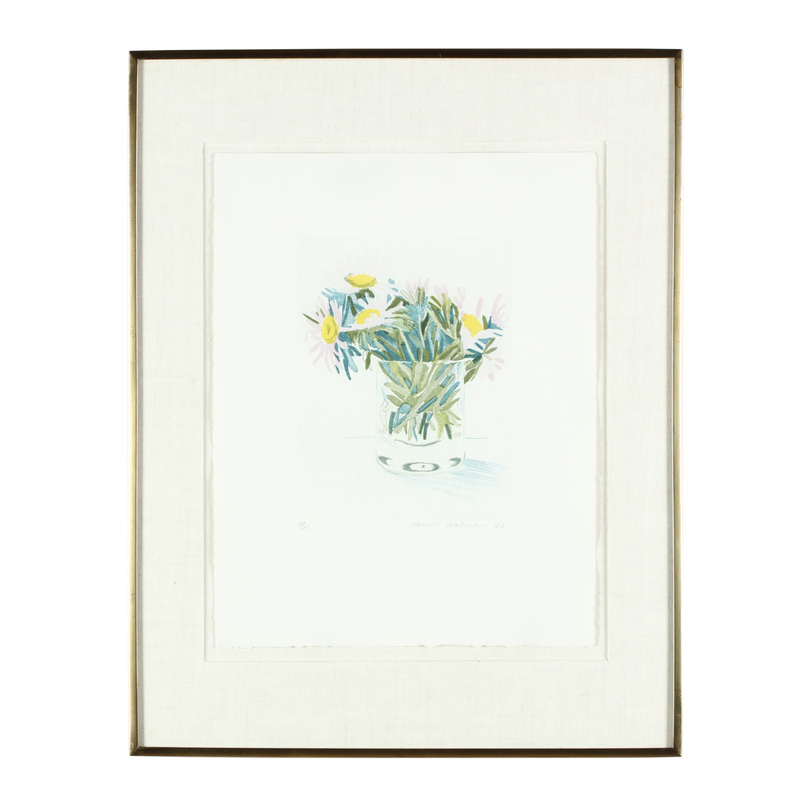 This series of 100 depict Marguerite daisy flowers in a vase and show Hockney's command of transparent surfaces (particularly glass) and his characteristic vibrant, saturated colors. 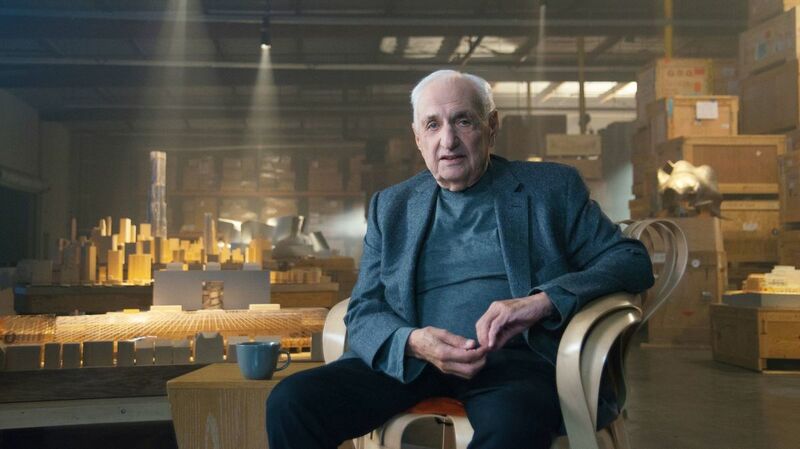 Frank Gehry, Power Play Chair. 1994, Knoll. 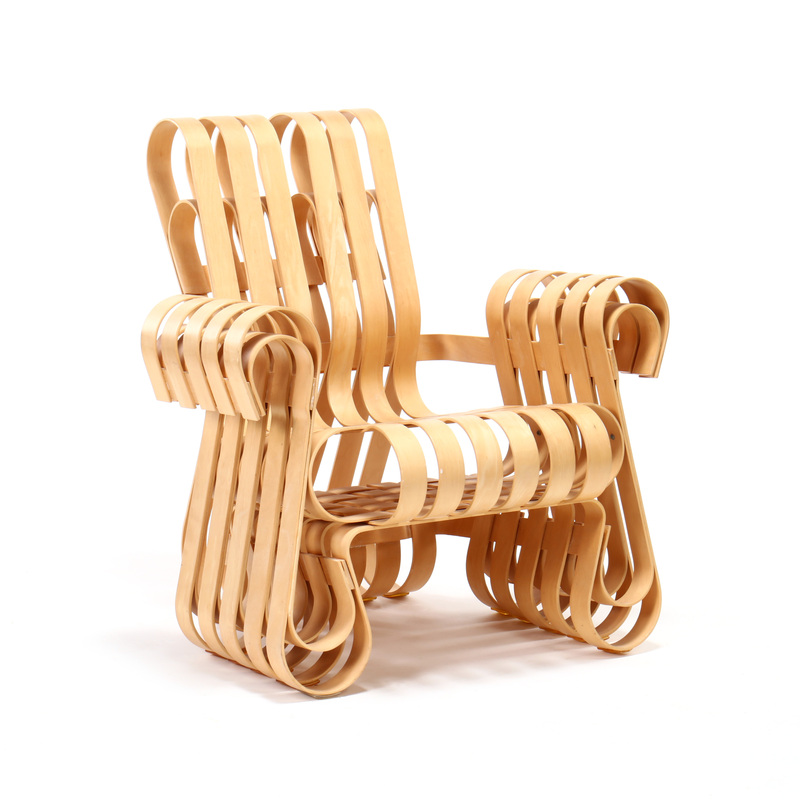 Frank Gehry designed this Power Play chair in 1994 for Knoll as part of his Bentwood collection. It was inspired by the apple crates he played on as a child, with the woven maple beams and block-like shape. Influenced by the Bauhaus and Le Corbusier, Gehry designed modern furniture and buildings in industrial materials (glass, steel, wood), incorporated fluid shapes and championed a whimsical minimalism. S. Kirk, founded in 1815, is known as America's oldest silversmiths. This service includes a coffee pot, two teapots, sugar bowl with cover, milk pitcher with hinged cover, and a waste bowl. Each item is handcrafted and features a bold acanthus leaf design with grape vine motif, each further decorated with borders of fruits and flowers. 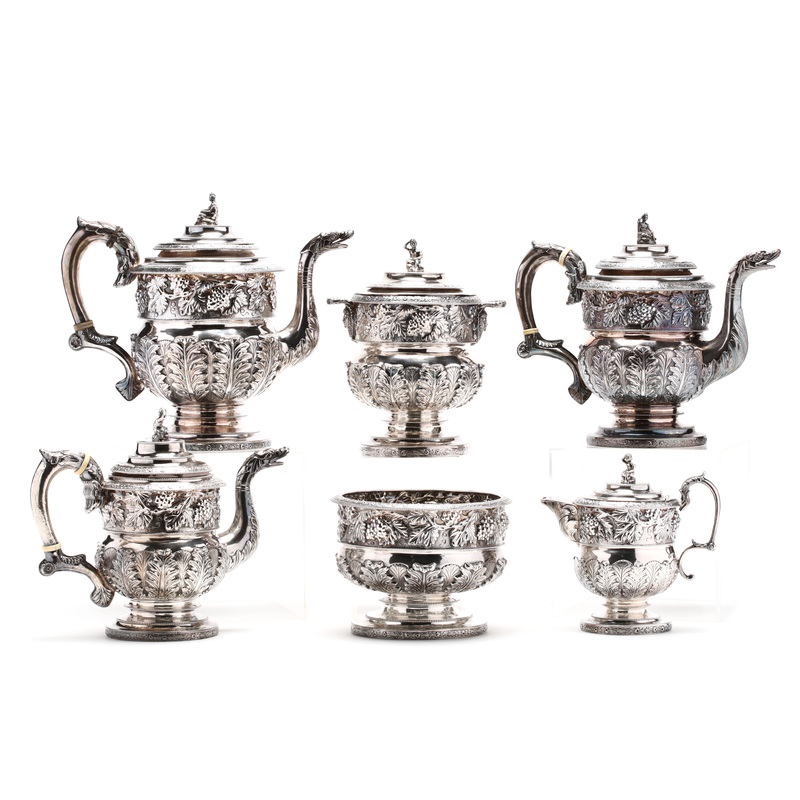 Each cover boasts a finely cast seated Bacchus figure, with the teapot and coffee pot handles and spouts terminating in a dolphin mask and the sugar bowl depicting female masks beneath the applied handles. 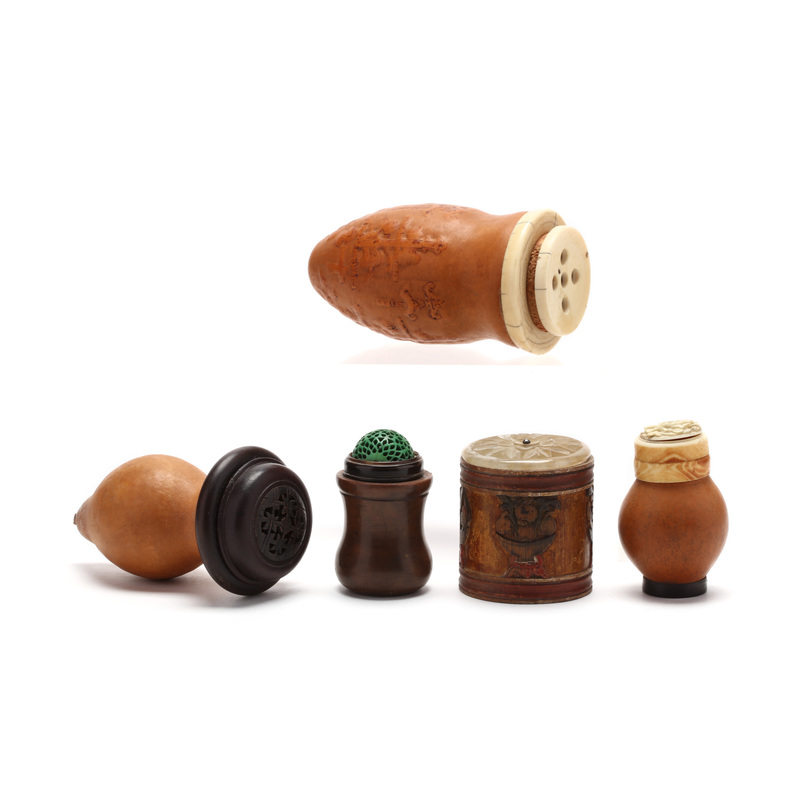 Beginning in antiquity, the Chinese kept crickets as pets, often inside elaborate cages or jars. These five antique Chinese cricket cages includes one large carved gourd cricket cage with auspicious motifs with a ivory rim and cover, another shaped gourd with trumpet neck and globular with carved wooden rim and cover, a smaller gourd with ivory rim and a reticulated carved ivory cover with floral design, a hard stone cage with hard stone rim and reticulated ivory cover painted green, and a carved wooden tubular cage with raised painted decoration of bowls of fruit on the exterior and a carved floral hard stone cover.